I participated in an Influencer Activation on behalf of Influence Central for Wedding Paper Divas. I received a product and a promotional item to thank me for participating. By now, you all know that I'm planning my wedding. (Which is less than 4 months away, btw!) And I've encountered various kinds of brides and ways of approaching a wedding. I am 100% that girl who has pictured my wedding forever and the main theme and aspects of the wedding that I've always dreamed of? They're happening. I've always wanted to get married in the church I grew up in-and I am. I've always wanted to wear my mom's dress-as I am. I've always wanted lots of red roses. Happening. I've always wanted red and white as the colors-yepp. And then in the couple years leading up to my actual engagement, Michael and I had settled on various aspects of our future wedding. So...suffice it to say....we have a very clear vision and it is being realized! And that vision is being consistently realized in every aspect of the wedding--not the least of which is the stationary! It's always super important that your stationary (save the dates, invites, thank you cards, bridal shower invites, etc.) are cohesive with your entire wedding--they're oftentimes the first (and last) impression your guests will have about your wedding so make sure you get the whole thing off on the right foot! 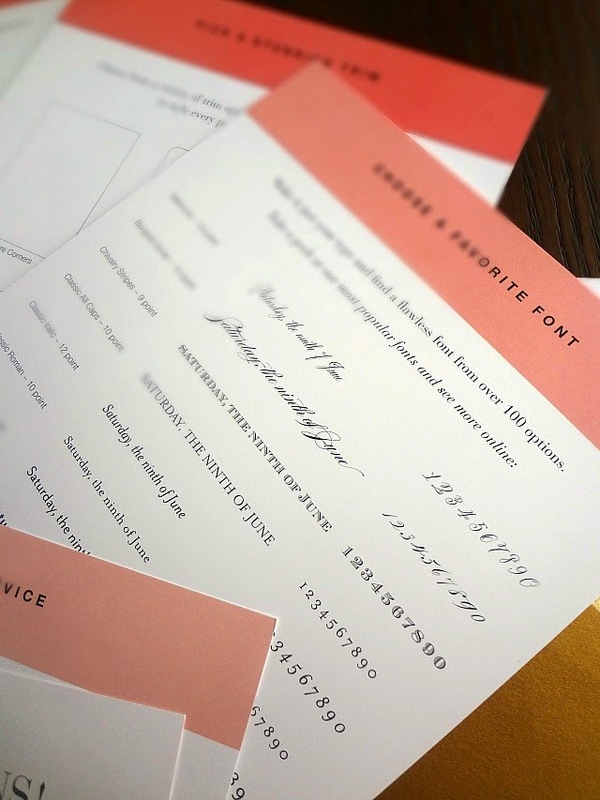 One amazing place to turn when you're looking to order your stationary is Wedding Paper Divas. Wedding Paper Divas is your ultimate destination for your wedding stationary needs! I actually ordered my Save the Dates from them this past summer and I ADORE them! One thing that makes them my fave is the affordability (and they constantly have some sort of sale or discount offer!) I also really like their free designer review feature (after you order and before your stationary ships you'll get fully customized proofs sent to you from a real, actual, person and you can even email back and forth with them if necessary until you are 100% satisfied and approve them! On that same note I have had various conversations with customer service about a few different issues and they always are great about addressing and fixing any issues.) They have a ton of options (that are constantly expanding to keep up with the latest trends)-that can also be customized in a variety of ways! In addition to having custom color options, there are plenty of designs that include the option to add photos so you can tell your own special love story (with engagement and/or wedding photos, etc.! 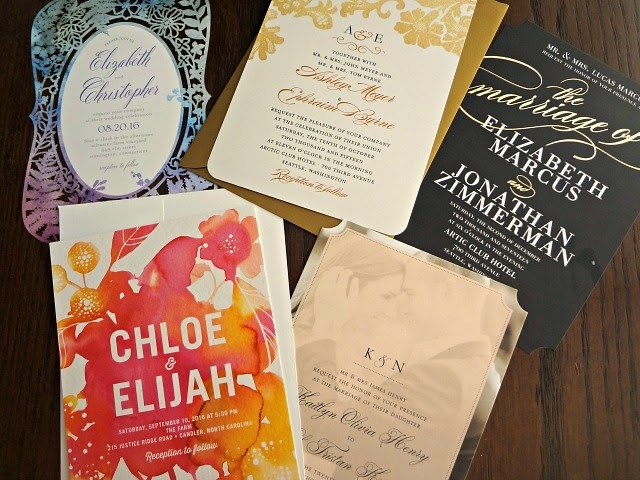 ), plus there are a variety of trim options, sizes, fonts, formats (postcards, magnets, tri-fold, and so on), luxe paper types (ranging from signature matte to pearl white shimmer), premium printing techniques (ooh la la thermography and engraved and more! ), PLUS complementary DIY options (which include ribbons, belly bands, gift tags, and such). So many options that it can almost seem a bit tricky on what to choose, hm? LUCKILY you have the option of ordering free samples to help you make your decisions! First of all-you have 2 options when ordering samples. 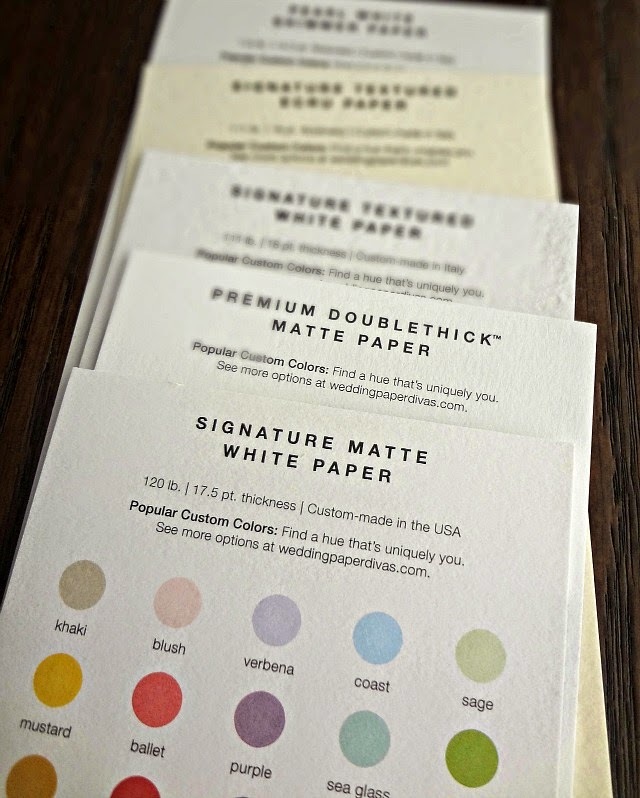 You can order the Wedding Paper Divas sample kit (completely FREE!) and you'll get 5 invitation samples as well as an entire packet with color swatches, paper options for you to feel, a page about fonts, etc.! (They even give you a discount code!) It's a great way to get started. Now, Michael's uncle owns a printing business so we've already ordered our wedding invitations from him. But I did order my bridal shower invites (for 2 of my showers) and thank you cards from Wedding Paper Divas, so I used the sample kits as sort of a way to see how the paper types for those stationary items looked (since they were included in the kits) and to sort of have fun and decide what invitation type I would have gotten from them if we didn't have a family member hooking us up! 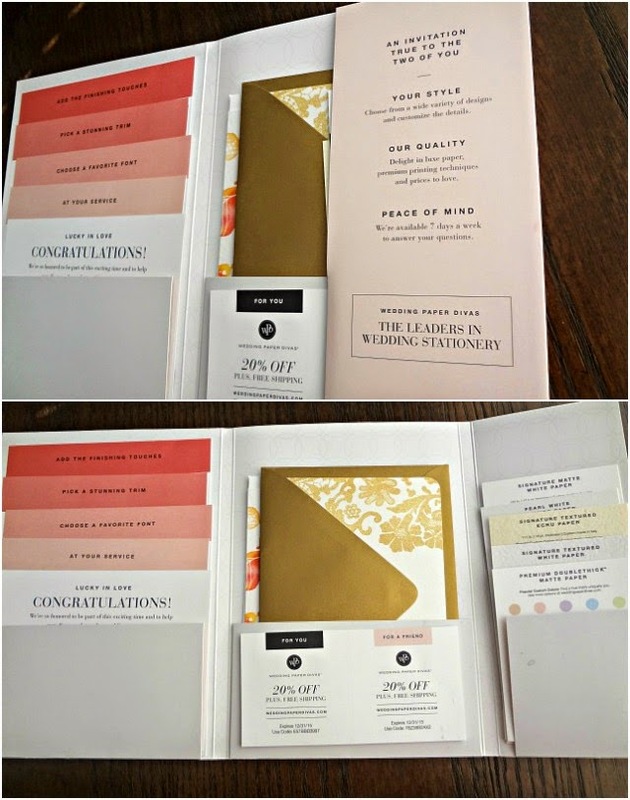 Every invitation sample that I received-from both kits-was beautiful. I loved how the rich red and red lantern colors came out (which is great since I chose those colors for my thank you cards and bridal shower invites) and I actually prefer the simplicity of the signature paper types, which, again, is good! Since that's what I am getting. 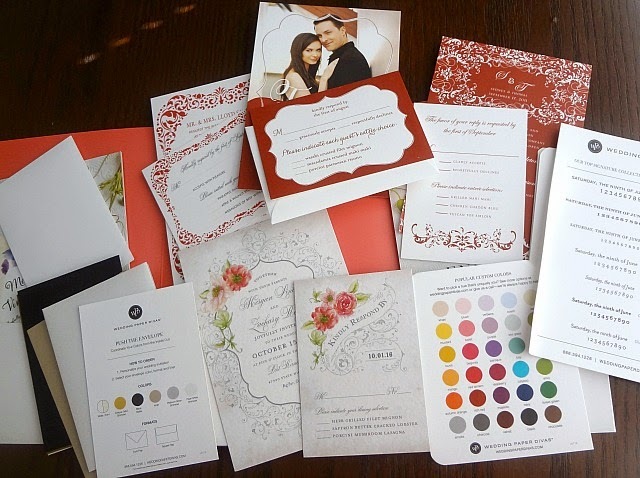 Really, the sample kits give you all the tools you need to help you order the perfect stationary for your special day!